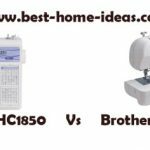 Janome HD1000 is one of the best heavy duty sewing machines available in U.S. Some might consider the price to be high, but this one is a sturdy workhorse. If you are looking for a long term investment, consider this one. Janome HD1000 is a very solid machine. It is heavy duty and it is meant to last long. The body of this sewing machine is all metal. But it is not that heavy for a heavy duty sewing machine. This sewing machine reminds me of the old classic, durable machines my grandmother used to have. It has 25 year limited warranty. 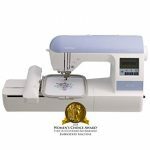 It comes with 14 built-in stitches including utility stitches and stretch stitches.You can change the stitches and stitch length using the knobs. Knobs are very resistant and sturdy. There is also a reverse stitch button. It has a free arm for sewing pants and cuffs. It comes with a foot pedal. The automatic needle threader will save your eyes from strain. There is a small storage compartment underneath the machine. Janome could have made the storage compartment a little bit bigger I guess. It has a thread cutter as well. The bobbin is front loading. The knobs feel quite sturdy ( I like that). The knobs make good click sound when turned, it doesn’t wobble. 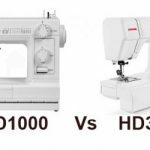 Janome HD1000 has all the looks of an expensive machine. The feet lock mechanism on this sewing machine is pretty sturdy, it won’t come off even if you are pulling on it. It is very stable.It goes through multiple layers of fabric quite smoothly. It also has extra high foot lift for dealing with multiple layers of fabric. You can easily change stitches in the middle of a stitch. If you consider the quality of stitches, it does a pretty good job. 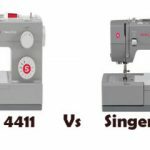 Janome could have included a lot more built-in stitches. 14 is very few for me, they could have included at least 30 of them. The machine is slightly noisy as well. 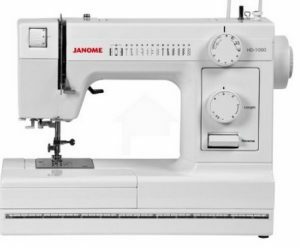 Overall Janome HD1000 is a very very solid and stable sewing machine for the price. It lives up to its heavy duty label. It is a real work horse. 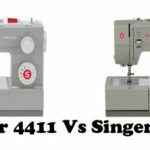 Some might feel that it is expensive than Singer Heavy Duty 4423, but this one is all metal (if you ignore the plastic for some small parts) unlike 4423 which has more plastic parts than you probably like.